Above-ground deck piers are precast, tapered concrete blocks with a wide base that are intended to rest directly on the ground or a concrete base. When constructing a deck in an area that receives minor amounts to no frost, these piers often serve as suitable deck footings. If the area receives frost, the piers can be installed above ground, but they normally require additional support underneath. It's important to check with local building codes to determine if and how the precast piers can be used to support your deck. The weight of the deck and soil conditions must also be considered to determine whether above-ground piers are suitable supports. Precast piers offer sturdy support for many decks. If the weight of your deck along with the local climate, type of soil and local building codes allow for above-ground deck piers, installation can save a lot of hard work over below-ground options. If your soil is firm and the climate is suitable, you can place the piers directly on level ground to support your deck. In areas with soil and climate concerns, building codes might require you to pour a concrete base below ground to place your piers for extra support. In areas with very stable soil, your local building codes might allow you to place precast piers directly on top of the soil. It's also important that no frost occurs in the area, because freezing and thawing cycles can cause the piers to rise and fall. If this type of movement (frost heave) occurs simultaneously in different areas, the tension can cause damage to your deck, such as twisting and cracking. Additionally, damage can occur to your house if the deck is attached instead of free-floating. If your area receives frost or has unstable soil, you need to create a concrete base for supporting your above-ground pier. Where frost exists, you must pour a deep concrete footing, ensuring that the bottom falls beneath the frost line for your area. Embed the pier an inch or two into the top of the concrete, keeping it above ground so that your posts are protected from contact with the soil and possible rot. The pier will be held firmly in place to prevent frost heave and damage to your deck. To successfully use precast piers on your deck, you must make sure that they can support the weight. Not only must the piers carry the weight of the structure but the addition of furnishings and people at one time. It's important to determine the entire deck load before choosing the piers, because there are different sizes to accommodate various deck loads. The piers also must be positioned correctly to evenly distribute the total weight of your deck. 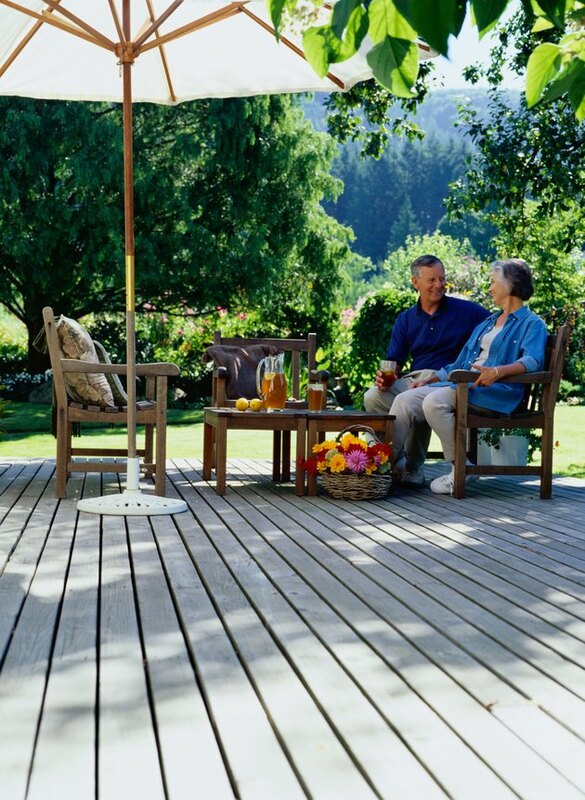 Should You Bolt Your Gazebo to Your Deck?